A giant of the genre has fallen. Jack Vance has died at the age of 96. It is impossible to overstate Vance's contribution to the fields of both science fiction and fantasy. His impact is comparable to J.R.R. Tolkien and Robert E. Howard, although in Vance's case it was at a remove: Vance was a huge influence and inspiration to writers such as George R.R. Martin, Gene Wolfe, Gary Gygax, Neil Gaiman, Tad Williams and many more. Vance (real name: John Holbrook Vance; Jack was his pen-name) was born in California in 1916 and was raised in San Francisco and nearby Oakley. He studied engineering, physics, journalism and English at the University of California, Berkley. Vance was working an electrician at Pearl Harbour in Hawaii, returning to the mainland just a month before the Japanese attack. Vance initially failed to qualify for military service due to weak eyesight. He memorised an eye chart to get into the Merchant Marine and worked on cargo ships crossing the Pacific. "The mark of good writing, in my opinion,is that the reader is not aware that the story has been written; as he reads, the ideas and images flow into his mind as if he were living them. The utmost accolade a writer can receive is that the reader is incognizant of his presence." - Jack Vance, This is Me, Jack Vance! Vance's interest in science fiction and fantasy began at a young age; early attempts to write SF for his English classes drew disdain from the teachers. It was during free time serving in the Merchant Marine that Vance conceived of his most famous creation: a time in the dim and distant future when the sun is dying and about to go out, and the world has become populated by fantastical creatures and astonishing technology coexisting in the ruins of ancient cities. He wrote a series of linked short stories in this setting which was - eventually - published as The Dying Earth in 1950. The book was hugely influential on a generation of readers, including George R.R. Martin (who cites Vance as his favourite author and one of his primary influences) and Gary Gygax, who 'borrowed' both Vance's magic system and several of his spell names for the Dungeons and Dragons game Gygax published in 1974. Vance followed up The Dying Earth with a duology of novels following the adventures of the scoundrel and reprobate Cugel the Clever, The Eyes of the Overworld (1966) and Cugel's Saga (1983), before rounding off the series with a concluding set of linked short stories under the title Rhialto the Marvellous (1984). In 1946 Vance met and married Norma Ingold (who sadly passed away in 2008). Norma helped Vance in his writing, typing up his longhand drafts into submittable manuscripts. In the late 1940s he began making money by selling short stories and writing scripts for the Captain Video TV series. Though writing did not become his sole occupation until the 1970s, Vance was able to fund frequent overseas trips with his income. He and his wife would spend months at a time living in places like Ireland, Kashmir and South Africa, with Vance pounding out more stories and novels on a keyboard whilst soaking up the local culture. Vance became close friends with several other SFF authors of the period, spending several months living near Frank Herbert on an extended trip to Mexico. Vance's sight began failing him in the 1980s after an operation to treat glaucoma went wrong, but he continued to write with the help of Norma and computer voice-recognition software. Astonishingly, despite being completely blind when he wrote most of it, Vance was still able to write one of the greatest works of fantasy literature in the 1980s, the Lyonesse Trilogy. Set in a fictional archipelago in the Bay of Biscay that would later sink, this trilogy sees people (including humans, fairies and the fearsome Ska) and cultures clashing for control of the islands and their destiny. Vance's mastery of language was at its peak in this trilogy, consisting of Suldrun's Garden (1983), The Green Pearl (1986) and Madouc (1989). In its omnibus edition, this may be the finest one-volume work of fantasy of the 20th Century, matched only by The Book of the New Sun (which itself can be seen as a literary rewrite of The Dying Earth), The Lord of the Rings and the Gormenghast omnibus. Vance also wrote many works of SF, including the Ports of Call duology, the Cadwal Chronicles trilogy, the Gaean Reach series and, most famously, the five-volume Demon Princes series (often cited, alongside Dying Earth and Lyonesse, as one of Vance's three masterpiece series). He also wrote the one-volume planetary adventure, Big Planet (1957), set on a planet considerably larger than Earth and again noted by George R.R. Martin as an inspiration for A Song of Ice and Fire (Martin spent some time planning to make Westeros's planet far larger than Earth as well, but seems to have backed off a bit from this idea). Christopher Priest has penned a memorial to Jack Vance here. George R.R. Martin muses on Vance and his influence here. The Guardian is also collating various tributes to Vance here. The Encyclopedia of Science Fiction has a more detailed account of Vance's career here. 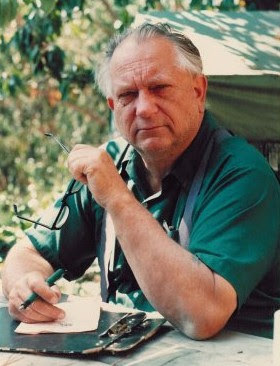 Jack Vance died on 26 May 2013 at the age of 96. I was sad to hear of his passing. I read most of his books and stories since I was introduced to them as a teenager (I even have the comic-version of Tschai). He made the world a more colorful place for being in it and sharing his tales. One of the all time greats. Like Andrew, I have a bunch of unread Vance in my TBR stacks. I'll remedy that soon. I have all his works except for some short story compilations, and consider him the master above all other writers. One of my all time favourites, and one of the most re-readable authors anywhere.